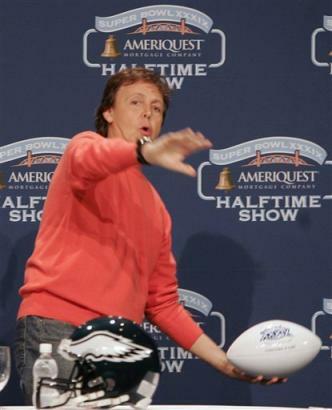 Looks pretty obvious that Sir Paul is more used to footy than American football. In other, related news, I am sorely going to miss watching Redskin games. :(. I was gonna get DirecTV, and thus be able to get the NFL season ticket, but taking into account other variables, Dish Network was the better choice for us. I’m sure I’ll find a ‘Skins fan bar down here, anyway, and probably end up paying less overall for beer than I would for the NFL season ticket on DirecTV.